When we think of the word, “daycare,” it’s often assumed this means child care for infants, toddlers or preschoolers, who have not yet entered grade school, and need to be watched for the day while their parent(s) work. This is very true. However, it leaves out the consideration of another big group of kids who still need daycare – the older ones! School-aged kids get out of school around 3 p.m. They start around 9. But of course, many working parents have to be at their workplace by 9 a.m. (at the latest), and often don’t finish work until 5 p.m. (using a generic example). They may also have a long commute by the time they get home. So, what happens to their kids in the early morning hours, and later in the afternoon and early evening? That’s where childcare extends into the later years. Some parents have the option of asking a neighbour, baby-sitter or relative to watch their older, school-age kids. Some choose to let them be cared for by older siblings, or even to stay home alone (after a certain age). However, there are exceeding benefits to a structured, before and after school care program. We’ll explain those benefits in this article. Perhaps the top reason to enroll your kids into a before and after school care program is peace of mind. Knowing your kids are not wandering the streets, or doing what they should not be doing at home, is a big plus for safety. Structured programs for before and after school care come with built-in adult supervision, among other things. They are also usually in a facility that resembles a school setting, where strangers can not easily enter (at least not without anyone noticing). So, for parents who want to work, these programs can mean fewer ‘emergency’ calls to deal with ‘kid problems’ that may happen at home. They can reduce the pressure to get home as fast as possible. Working parents can focus on their jobs without worrying, and without the guilt of neglecting their kids. The daycare centres are taking care of it all. They’re probably even dropping off and picking up the kids from a nearby school, and scheduling snack times to make sure the kids are not starving before dinner! This type of safety is just not the same as having older siblings watch out for younger ones. Older kids usually need their own attention, and have their own worries outside school. They’re not likely to be vested in your younger child’s safety. Or worse, if they are the ones getting into trouble, that can be an opening for the younger kids to copy those behaviours. Let’s not forget about sibling fights, either! While this may sound like a stereotype, we can’t deny that most kids aren’t going to eagerly engage in learning activities and pick up novel interests on their own. Some do. But a lot of them would just as well sit in front of a TV or play video games if they aren’t encouraged by an adult to make something of their time. For those who get bored of TV and video games, there’s likely the influence of friends (whether in the house or outside of it). Combine that with peer pressure to do so-called, ‘bad’ things, with no one around to intervene… well, you can see how that can be a recipe for disaster. According to Understood.org, the after-school hours are when most kids find the time to get into trouble. Being in an after-school program can keep them happy, engaged and definitely not bored. These daycare centre for older kids provide several things to do, and people to do them with – both indoors and outdoors. An adult can also be there to supervise, in case behaviours among peers start to become a concern. A sidebar on this point is that some kids decide to start babysitting around age 12, when these before and after school care programs end. Having experience engaging with younger children in these out-of-school settings can be excellent learning prep for their future hustles as money-earning pre-teens! Not that we’d recommend a 12 year old baby-sit ‘for real’ (if you know what we mean…adults should be close by, ideally). But, before and after school care is not just about having toddlers and preschoolers to play with! Most of the time, the older kids get to socialize in a different room, play their own ‘big kid’ games, and maybe even make friends with those who don’t go to their school. It’s a great transition place that’s not quite like playing at home, and also not quite like learning at school. It’s a good mix of both; a relaxed, but semi-structured social environment. 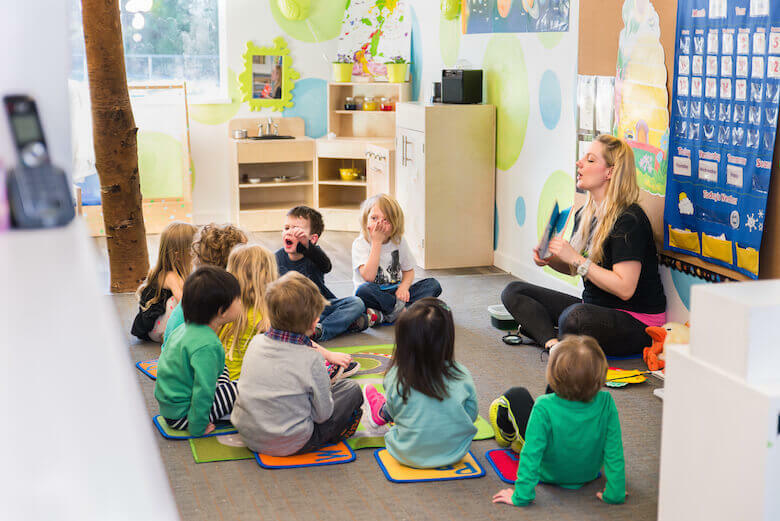 Professional daycare programs for before and after school care are usually run by educators, with some level of training and experience. They are focused on teaching, and ensuring the best for a child’s healthy development – whether as a toddler or as an older kid. So, helping kids with homework in these programs is absolutely not unheard of. It’s one of the things you can expect: that if a child needs help finishing their homework, they can get that help at a daycare program for their age. This again takes the pressure off of parents to rush home to do this themselves, or to hire a tutor (which is still needed in some cases). It’s also a relief for parents of children who are struggling in school, or who have special needs or attention issues. Sometimes, these kids need an extra bit of attention to do their schoolwork, from someone who is not mom or dad. When homework is done, the kids also have an environment full of educational learning opportunities to ‘get lost’ in. They can pick up crafts, baking, sports, games, reading and other activities too. If they have special interests, it’s likely a childcare worker can help them develop those interests, too. While the childcare workers may not be music or swim teachers, nor have the ability to get your kids to those types of classes, this is certainly a better option than nothing. That is, if you’re a working parent who needs the extra hours of consistent, quality childcare before finishing up with work. As we have seen above, before and after school care programs can give parents peace of mind about their kids’ safety, keep kids out of trouble, learn new social skills and responsibilities and finally, handle their out-of-school educational needs. In B.C., leaving kids home alone before the age of 10 is generally not advised. One woman lost an appeal to leave her 8-year-old alone. There are reasons for these types of concerns, as we’ve also mentioned above. Kids are just not likely to be the best caregivers of themselves, or older kids. At-home childcare may work (especially if kids are enrolled in many lessons during the week and need to be transported around town). But kids staying home, even with a nanny or relative, would be a missed social opportunity that a facility-based program could provide. In the end parents will need to work out their own schedules, and do what’s best for their kids. A before and after school care program can be a great, community-based way to keep kids in a healthy environment when parents are not around. Get in touch to see if we are a good fit for your child. education options to early childhood learners in the Metro Vancouver area. Monday – Friday, 7 a.m. – 6 p.m.